[We asked leading scientists of various fields to point out 5 needed breakthroughs that they would like to see in their own field of research. We are starting this feature today with the input from Dr. David Shoemaker. 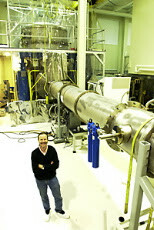 David Shoemaker played an important role in both the R&D effort and commissioning of the joint Caltech-MIT LIGO laboratory for the detection of gravitational waves. Currently, he is Director of the LIGO MIT Laboratory at Kavli Institute for Astrophysics and Space Research, MIT. He also leads the LIGO research group on Advanced LIGO Development. - Successful application of prepared states of light to improve the sensitivity of full-scale gravitational-wave detectors while keeping circulating power at technically acceptable levels. - A practical application of a method to regress out (via e.g., an array of seismometers) or reduce (via e.g., a mechanical design) the gravitational gradient noise, allowing lower frequency operation on the ground. - ....and, slightly different in character: The first direct detection of a gravitational wave." I feel there should be another LIGO Laboratory at some other corner of USA (say, Maine or Alaska or both if you have fund). It would be better option than upgrading current interferometers at Hanford and Louisianna because you can gain more SNR from a better coincidence operation. Once I told this to a professor at Louisianna State University but he did not pay any attention to my comment. why GW has not been discovered yet. Is that still an issue that needs to be solved? I teach Physics in Seattle. I visited LIGO Hanford observatory and took a guided tour led by Dr. Rick Savage and also met Dr. Fred Raab, Director. All LIGO scientists look very enthusiastic. Looking forward to the first detection of GW. Why would the passing GW not distort the laser beam(s) the same way it distorts the rest of the apparatus, making the measurement of GW-induced displacements impossible?